The RB0690X2 UPS Replacement Battery Cartridge restores life to CyberPower UPS systems that have weak or completely depleted internal batteries. 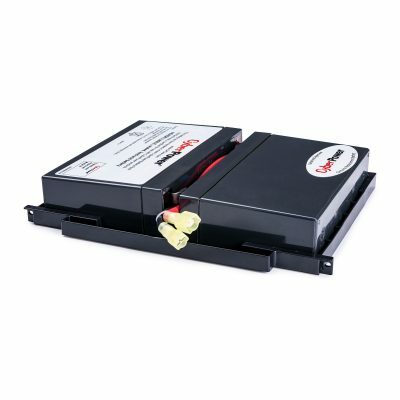 The RB0690X2 contains two 6V/9AH replacement batteries, certified to meet or exceed original manufacturer specifications. These leak-proof, sealed lead-acid batteries never require replacement fluid. The pre-assembled cartridge installs easily in your CyberPower UPS system and is shipped with reusable packaging for delivering expired batteries to a suitable recycling center. The RB0690X2 comes with instructions, recycling information, and an eighteen-month warranty. Supply high surge currents, provide robust power-to-weight ratios, and are cost-effective. Protects the sealed lead-acid batteries and prolongs battery life. Allows for quick and convenient installation; each cartridge is pre-assembled. Provides for conveniently delivering expired batteries to a recycling center. After installing the new cartridge, place the old one in the reusable packaging. CyberPower batteries meet or exceed original manufacturer specifications. Covers defects in materials and workmanship in the product under normal use and conditions within eighteen months of the purchase date. See warranty for details. This product can expose you to chemicals including Lead and lead compounds and Styrene, which is known to the State of California to cause cancer. For more information go to http://www.P65Warnings.ca.gov.